Editor Jon Sutton reviews Robert Macfarlane's new offering. ‘This is a book about the power of language – strong style, single words – to shape our sense of place.’ So begins this field guide to the literature Macfarlane loves, which doubles as a word hoard of wood, water and earth. There are thousands of terms from dozens of languages and dialects for specific aspects of landscape, nature and weather. That specificity is key – Macfarlane writes about writing ‘so fierce in its focus that it can change the vision of its reader for good, in both senses.’ And his own precision achieves just that… there are not many books I would call life-changing, but this is one. As with any good magician, I couldn’t begin to describe how Macfarlane operates. How does he, and each author he reveres, conjure a thicket of verbs, qualifiers and metaphors, yet simultaneously slash through sentences to reveal simple and striking images? I am so in thrall of him that the idea of ‘reviewing’ his work is laughable. All I can do is offer a particular example of why this book should be required reading for psychologists as well as for lovers of language. So the islanders began to salvage and create accounts – through narrative, poems, paintings, photographs, maps and more – which might restore both particularity and mystery to the moor. One of these ‘moor-works’ was made by Anne Campbell and Jon MacLeod, a booklet entitled A-mach an Gleann, or ‘A known wilderness’. They mapped their moor walks, reconstructing the memory maps of ‘the people who traversed this landscape before and after the peat grew, naming features to navigate their way round’. In this way they filled the island with ‘drifts of sparkling bog-cotton, ‘scarlet damselflies’ and hundreds of words for peat alone. Amidst 10,924 letters of objection, the moor was saved. 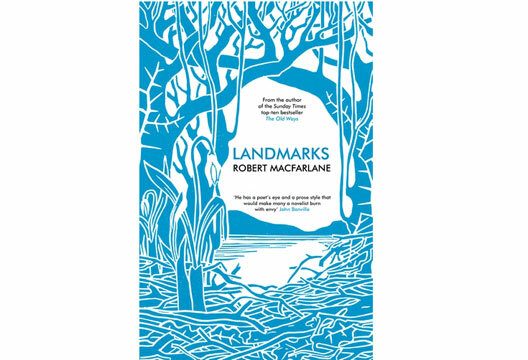 Macfarlane quotes Tim Dee: ‘Without a name made in our mouths, an animal or a place struggles to find purchase in our minds and our hearts.’ That is why this is a book for all – it gives a glossary for the natural world to talk back, and for us to listen. Words, wherever we use them, can ‘keep us from slipping off into abstract space’. - 'Landmarks' is published by Penguin Books. There are numerous fascinating pieces about and interviews with Robert Macfarlane online.